Learn the best ways to keep you and your loved ones safe during summer adventures in (and on) the water! 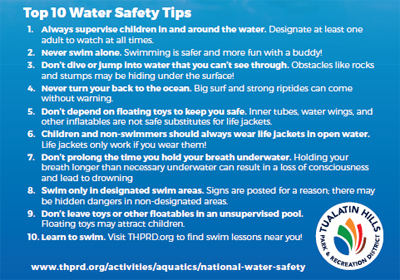 Visit any THPRD aquatic center this month for special events, tips, contests and more as we celebrate National Water Safety month. Ready to get paddling? Sign up for a swim class and check out one of the great events going on this month in honor of National Water Safety at THPRD. The number one way to stay safe in the water is to learn to swim! We offer classes for all ages and levels from beginner preschool to advanced pre-lifeguarding classes. Curious about getting your 6 month to almost 6 year-old introduced to the water? Read about baby Hannah’s experience with dad. This one-on-one instruction program is designed for all ages of people experiencing disability. Need a water/aquatic lift? Be sure to look for programs at Beaverton and Harman swim centers. From Deep Water Aerobics to Aqua Jogging, Cardio Core and more… check out a wealth of ways to get fit in the pool at any of our aquatic centers!